Industry and homes cannot use unabated methane indefinitely, because any greenhouse gas emission is bad. This argument appears to hold strong among European policy makers even if using gas has chipped away at the edges, through the displacement of coal from the power sector, for example. From this perspective, the oil and gas industry can only buttress its future by removing carbon from the gas at the start or the finish of the cycle. And this explains the majors’ Oil & Gas Climate Initiative’s fund to clean up its act, which now includes a carbon dioxide capture and storage (CCS) element. It involves a Teesside power plant project but it cannot expect to receive UK government money for all of the costs associated with this. Some of those same companies are also involved in other CCS initiatives, such as French Total, a big producer of west of Shetland gas, which it delivers to St Fergus, a major beach terminal in Scotland. It is working with privately-held Pale Blue Dot on its Acorn CCS project. On December 6, the offshore regulator Oil & Gas Authority said it had awarded PBD the first CCS appraisal licence. PBD is seeking to re-use existing oil and gas infrastructure for transporting and storing CO2 for which St Fergus will be pivotal. PBD’s founders have direct experience of late-life gas fields, CEO Alan James told NGW in an interview soon after the licence was announced. Many of these were also potential targets for CO2 storage projects. Their rationale was a shared discomfort about the consumption of fossil fuels and the effect that they are having on climate change. Gas is still dirty, even if only half as much so as coal, said CEO Alan James. Using underground space as a permanent storage for CO2 emissions from power-stations and industry led to the business starting up in 2007 with a series of project ideas that were mature enough for development. By the end of 2009 the partners were looking to reverse the business into a large corporation with a strong balance sheet and engineering capability, he said. He said Petrofac was “quite excited by the synergies,” so the PBD team became a part of that, as it partnered with Shell for the Goldeneye conversion into CCS. There were two projects: the Longannet and the Peterhead power plants, neither of which went into development. “Then Petrofac had to restructure to focus on its core activities and CO2Deepstore was bought back in 2013 by PBD Energy. Having worked on several of the past government procurement attempts to deploy CCS, but seen the perceived cost to the public purse proving prohibitive, PBD has since been working on strategically selecting a site and designing the lowest cost possible starting point for CCS project infrastructure. That meant proximity to a beach terminal and available capacity in good quality, unused pipelines near good quality, offshore geological CO2 stores. “PBD identified a target area within the huge Captain Sandstone formation deep below the Central North Sea, which includes the Goldeneye site that was considered for previous competitions in the northeast of Scotland. But PBD is looking at new injection wells in this much wider area of sandstone rock. “We have been working very hard for the last year and a half in collaboration with other partners under the Accelerating CCS Technologies or ACT programme. With the ACT funding and partner support we were able to progress most elements of the Acorn CCS feasibility studies. However we were also awarded European Project of Common Interest status this year which has opened up further match funding through the European Commission’s Connecting Europe Facility fund, which was recently match funded by ourselves, Total and the UK and the Scottish governments. “This funding allows us to complete all the feasibility work on our CO2 transport infrastructure for the project: the pipelines, shipping facilities at Peterhead and the onshore gas pipelines that might be available for reuse. Acorn CCS could offer a viable option for shipping CO2 from other areas of the UK and mainland Europe as well as developing strong expertise to export to other places. “The St Fergus gas terminal is also the delivery point for around a third of the gas arriving into the UK. If this terminal had easy access to CCS infrastructure, it would be an absolutely ideal location for generating bulk hydrogen from natural gas, dealing straight away with the CO2 emissions using the CCS infrastructure, with the possibility of blending low levels of the hydrogen into the NTS. “One way to help support this development option, which offers large nationwide emission reductions with low to no impact on consumers, would be for the government to make it a requirement for, say, 5% of all gas to be hydrogen, borrowing the idea for 10% of unleaded petrol to be biofuel. A change like that would instantly create a business case for hydrogen and CCS and then we are away,” said James. One of the risks facing CCS projects is that the corrosive gas will find its way through the sandstone and out into the atmosphere. Reservoirs that have not held such gas before are therefore risky, according to one executive, and only a very small percentage of the available stock of reservoirs would be suitable for CCS. He told NGW that his own experience of injecting CO2 to increase reservoir pressure, in this case on a producing field in Algeria, had proved a failure for that reason. The title holder of the CO2 would presumably have to offset any leak financially, if it could even be calculated accurately; but this eventuality has been considered. James said: “There are about 600 offshore sites that could be used for permanent storage of CO2, which we have researched with a number of scientific research agencies such as Heriot Watt in Edinburgh and at Aberdeen and Liverpool universities. Not all of those sites are ideal for use as permanent storage sites and careful site selection is required. As the storage operator will need to drill wells and operate offshore, a strong balance sheet is important. “But just across the boundary, the Norwegian government has been behind the injection of CO2 into the Sleipner field for 20 years. Snohvit is also a CO2 injection site: the gas is brought on shore, the CO2 extracted and then returned through another pipeline and reinjected underground. The offshore side will be entirely unmanned and all the injection equipment will be on the seabed, which is a common approach in the Norwegian oil and gas industry to lower costs, said James. The title to the CO2 will transfer from the producer to the storage operator at the flange. The Gas Safety Management Regulations, governing gas quality in the national transmission system, have not been adapted for carrying natural gas blended with hydrogen. But James says gas appliances have been built to cope with a blend of hydrogen and methane for several years. 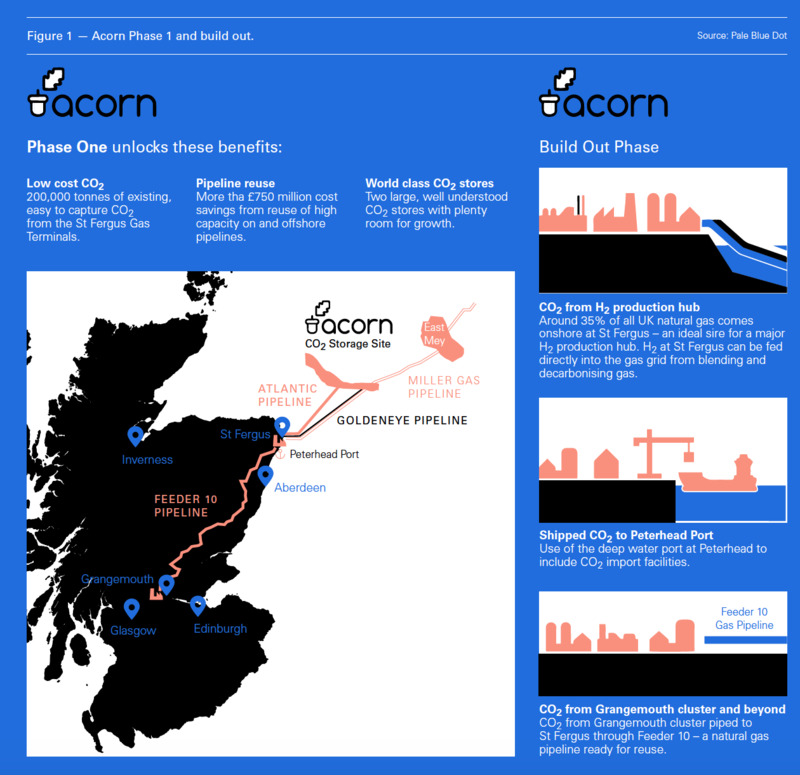 “In addition to our formal support for the current feasibility work on Acorn with Total, we are already talking to potential investors who can also bring operational clout including other oil and gas majors.